From the incoming raw materials to finished goods; continuous sampling, testing and verification are conducted continuously throughout the manufacturing process to ensure Mueller’s standards of quality and the customer’s expectations are achieved. With its Quality Policy serving as the foundation, Mueller Brass Company takes an unyielding approach on quality and continuous improvement to ensure its role as a market leader in the industry. As a resource, Mueller Brass Company has made available copies of its ISO 9001 Certifications, PED Certifications and MSDS Sheets for some of its Standard, Lead Free, Low Lead and Engineered alloys. Just click on the documents listed to the right to download a .pdf version. Mueller Brass is one of the only mills in North America to have a JOEL Electron Microscope. 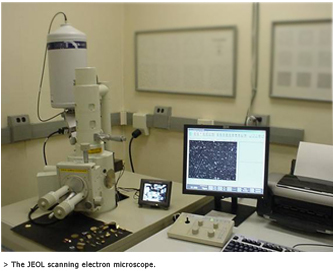 This microscope not only compliments the stable of state of the art laboratory equipment, but it enables Mueller to provide valuable analytical services equivalent to those provided by independent laboratories. 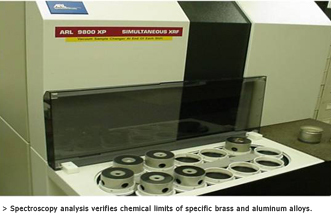 X-ray Spectroscopy is a valuable tool utilized to analyze the chemistry of its brass rod alloys both during and after production. This piece of state of the art equipment helps to ensure every alloy is produced to its correct specification and chemistry.